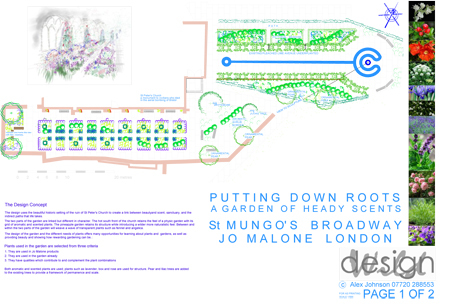 We have been shortlisted for the "Putting Down Roots" a project run by St Mungos Broadway, a charity for homeless people, and Jo Malone London, to promote opportunities for homeless people to undertake training in horticulture. The site of the garden is at the ruined church of St Peter at Castle Green, which is a memorial to people of Bristol who were bombed in the Second World War. The design maintains the rhythm of the existing physic garden beds, while introducing transparent grasses and umbellifers through the colourful planting. Aromatic and scented plants are used in profusion. To the side of the church lies a garden with a canal and a pineapple sculpture. 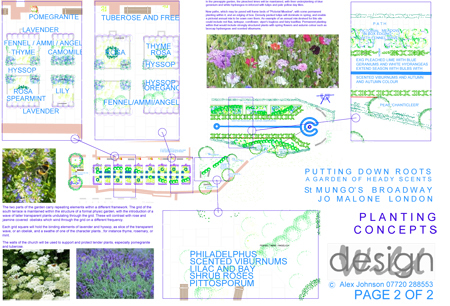 In this area the scheme proposes a "Pictorial Meadow" of wildflowers and perennial plants. The exisitng lime walk is to be planted with hydrangeas, hardy blue geraniums, scented shrubs and hundreds of white tulips.